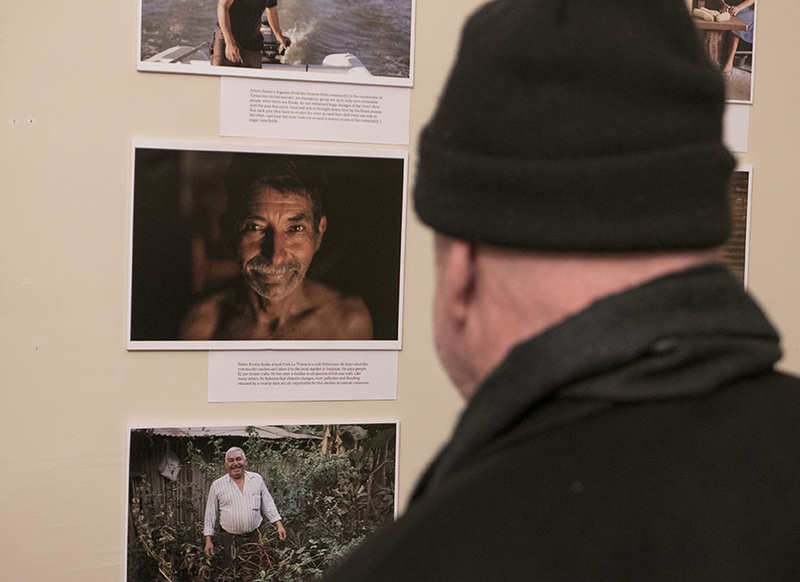 The following photographs were taken during the 4 March opening reception of Climate Change, System Change, Personal Change, at the ¡Buen Vivir! Gallery for Contemporary Art. 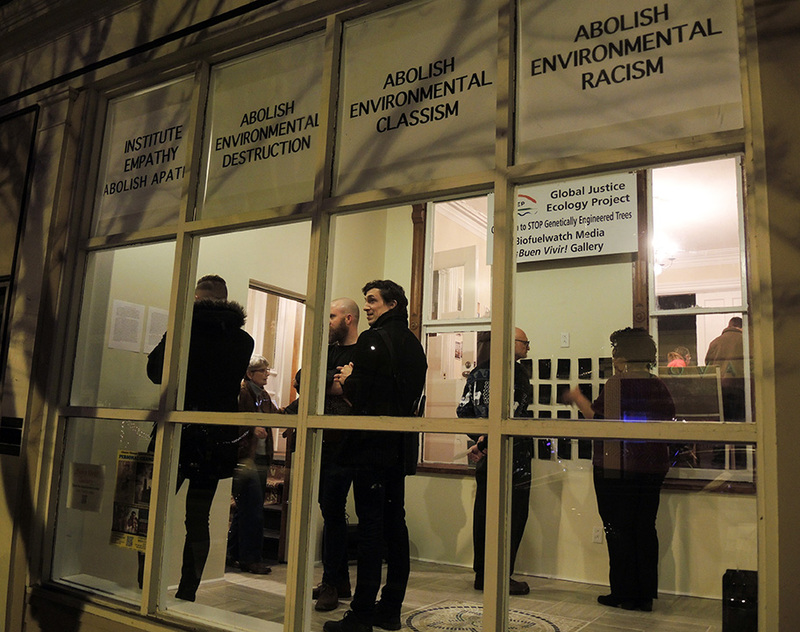 The show consists of two separate exhibits: Climate Change—Realities and Resistance by Critical Information Collective (CIC) photographers and Black on the Ground, White in the Air by artist Ashley Powell. Climate Change—Realities and Resistance with photos by Critical Information Collective‘s international climate photographers included: Luka Tomac, David Tao, Bogdan Bousca, Judith Deland, Jason Taylor, Orin Langelle, Stephan D. Melkisethian, Susan Melkisethian, Joseph O. Holmes, Ronnie Hall, Kathryn McWhirter, Stephen Ambrose, and Jean-Marie Drean. 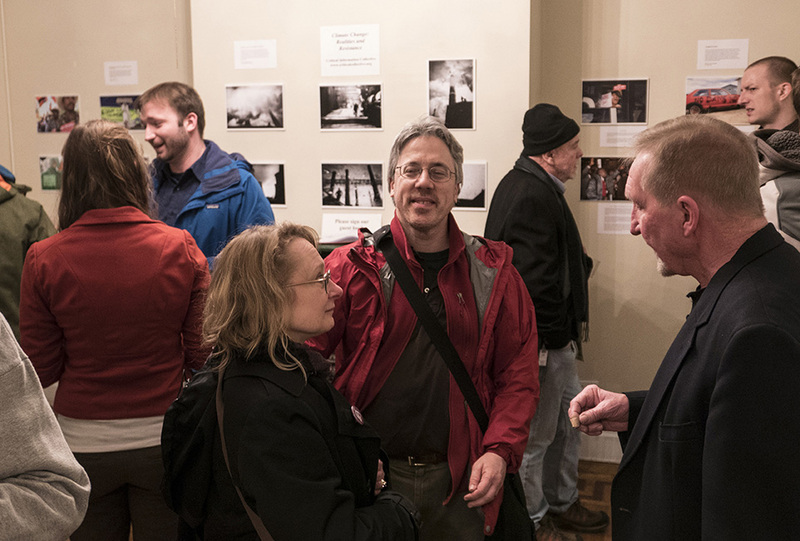 For images in this exhibit please go to this CIC photo page. Once again, we find ourselves attacked, and this attack isn’t physically immediate or verbally abusive, but it certainly is sinister, covert, and ongoing. Its onset is slow but the damage is long lasting. We are being attacked with environmental racism and classism. This type of racism doesn’t thrive off of foul words and violence, and this classism doesn’t inspire juxtapositions of economic disparity and grotesque frivolity. 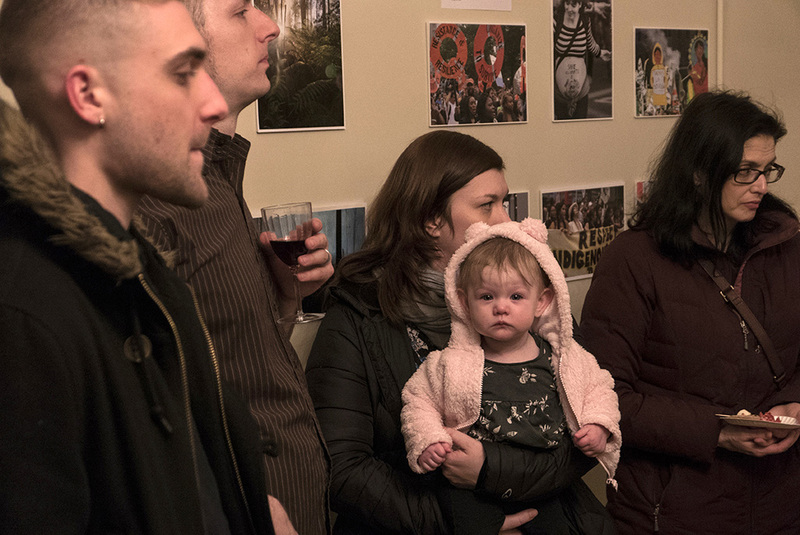 Instead, it is a type of racism and classism that perpetuates a system that lawfully allows for low-income and non-white peoples to be deliberately subjected to debilitating pollution, toxicity, and degradation, all for economic benefit and convenience. The show, at the ¡Buen Vivir! 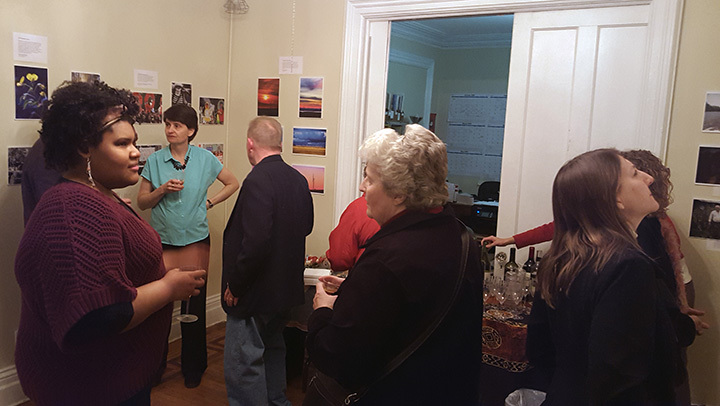 Gallery for Contemporary Art in Buffalo, NY runs through 29 April, 2016. The photos below are in no particular order. 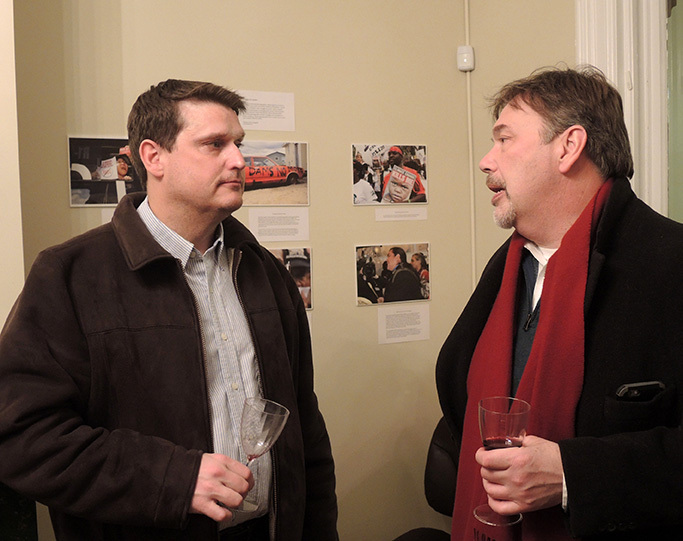 A large number of people attended the opening reception. The ¡Buen Vivir! 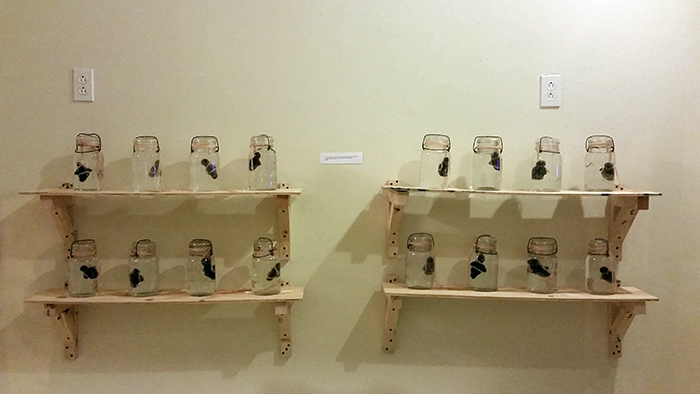 Gallery and Global Justice Ecology Project dedicate this show to the assassinated Honduran Indigenous rights activist Berta Cáceres and to activist Gustavo Castro Soto, who was injured during the 4 March 2016 attack on Berta in La Esperanza, department of Intibucá in southwestern Honduras. 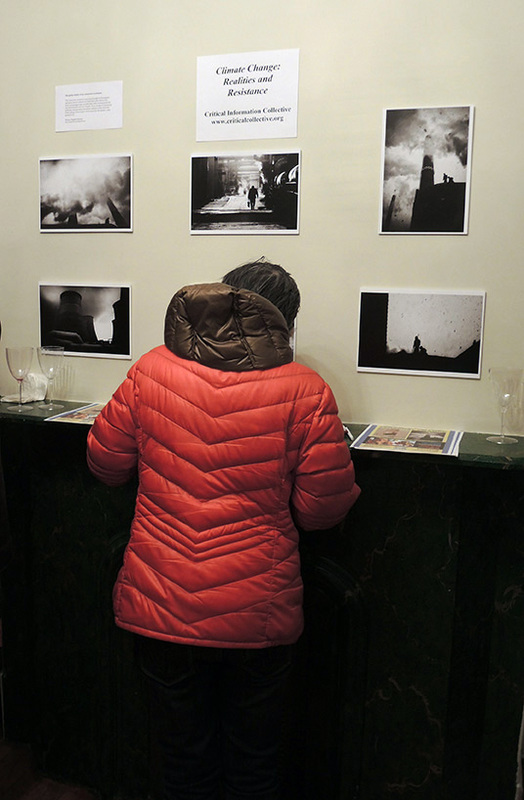 Woman views Bogdan Bousca’s photographs on the wall in Gallery #2. 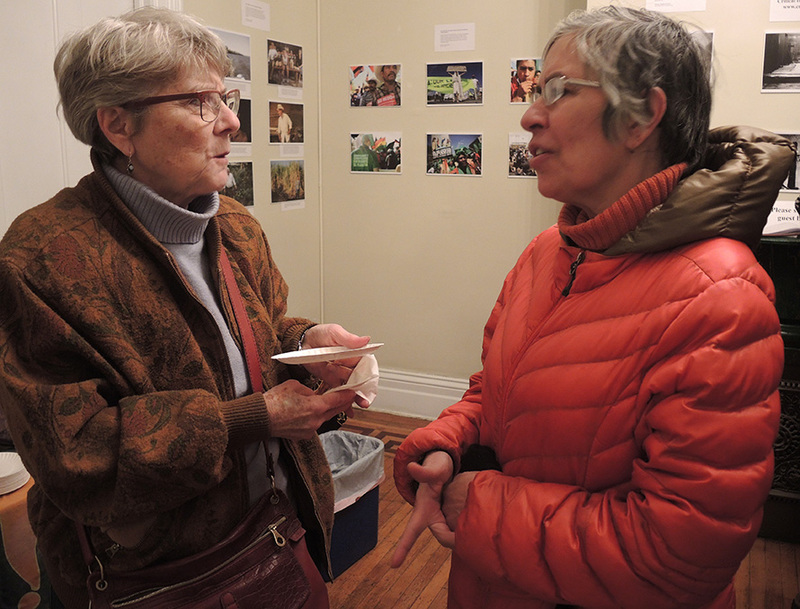 ¡Buen Vivir!’s Gallery Manager, Carolyn Lansom, points to a Judith Deland photograph. 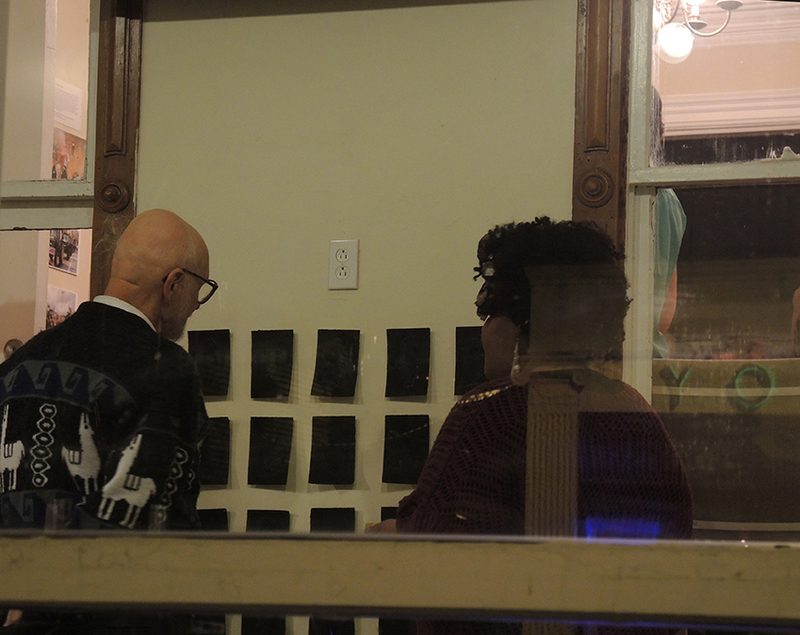 Outside view of Gallery #1. Ashley Powell installed the posters on the top. The rest of her work is in this gallery. 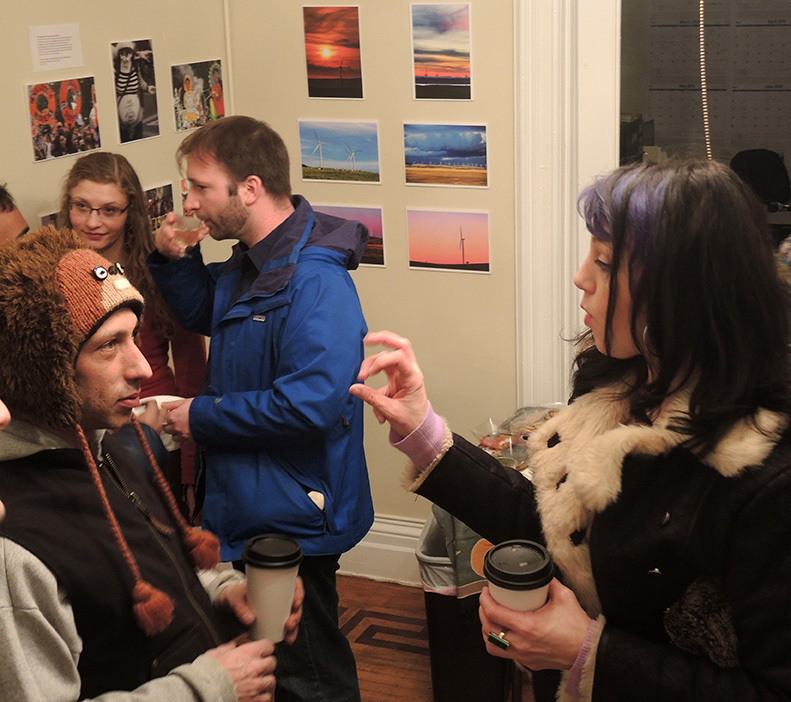 Artist Ashley Powell (left) explains her presentation on the wall Perfect Detoxifying Particulate Collectors 2016. Photos from Lake George in New South Wales, Australia in the back (center) by David Tao. 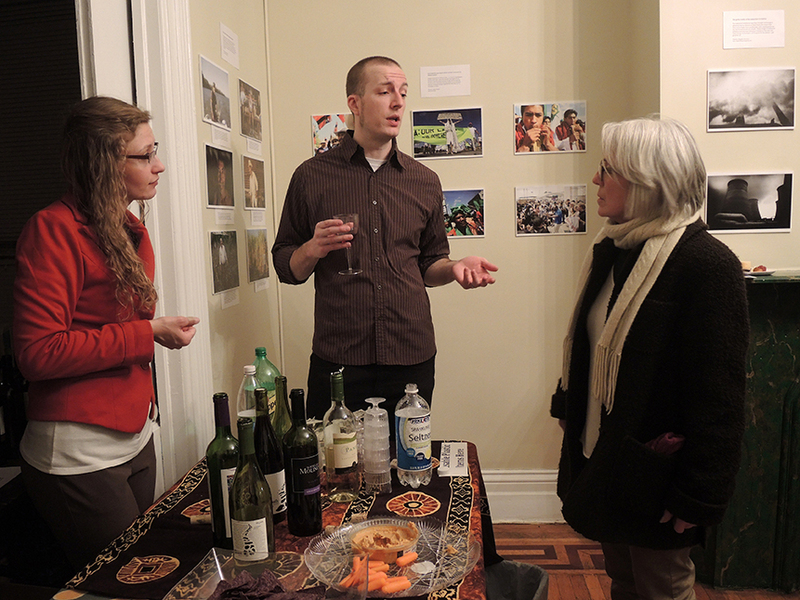 ¡Buen Vivir’s Gallery Manager, Carolyn Lansom (left) and Kip Doyle (center) speak to one of hundreds who came to the opening reception. Kip Doyle is the Media Coordinator, for the Gallery, for Global Justice Ecology Project and for the Campaign to STOP Genetically Engineered Trees. 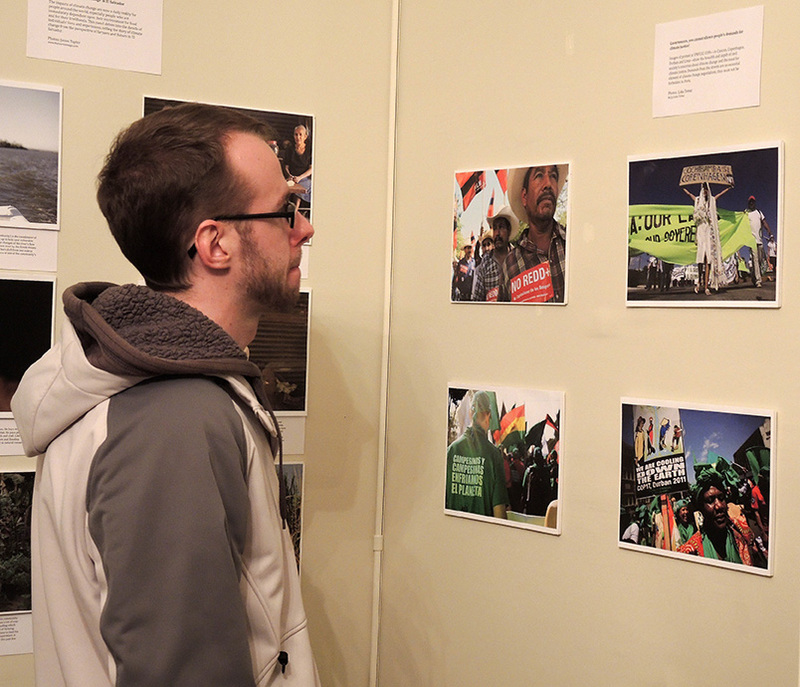 Orin Langelle’s photos on protests, mostly against the UN climate negotiations, are visible behind the two men talking. ¡Buen Vivir! 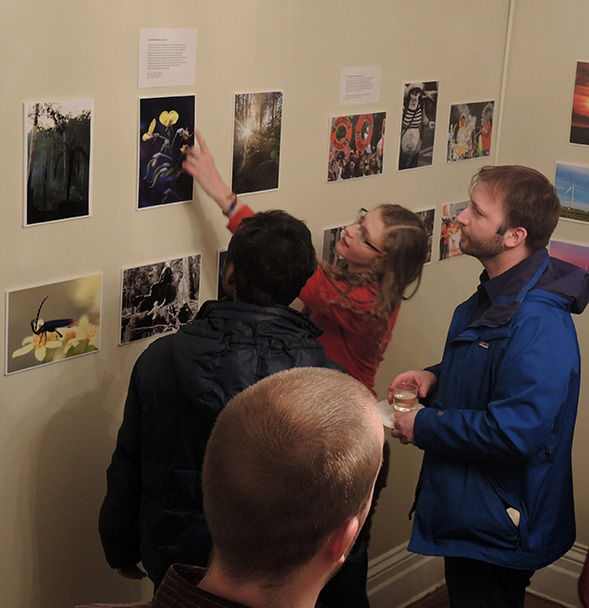 Gallery is intended to open space for discussion – as depicted in some of these opening shots. 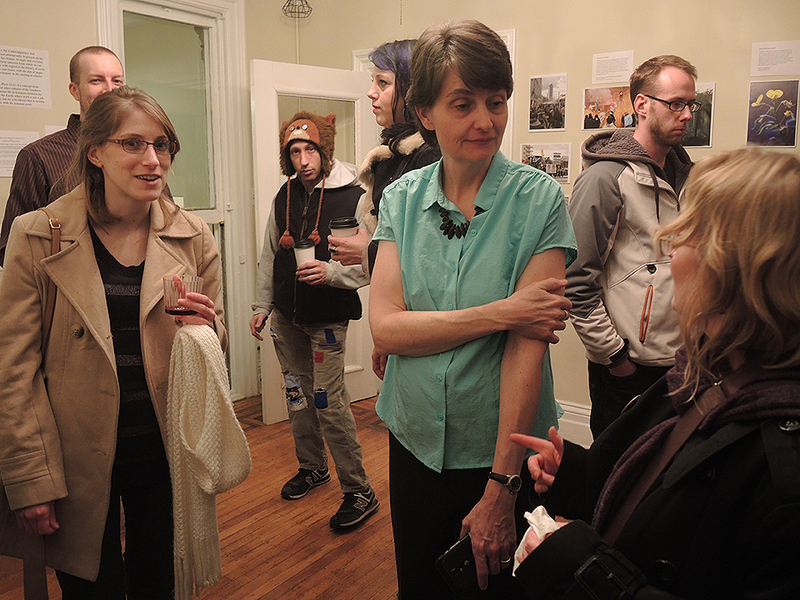 Anne Petertmann (center) Executive Director of Global Justice Ecology Project and Coordinator for the international Campaign to STOP Genetically Engineered Trees. 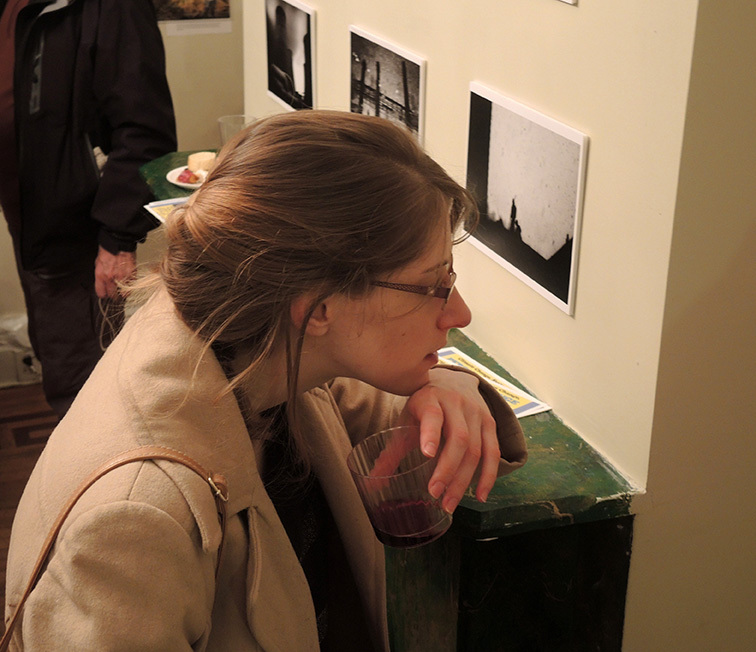 A person intently looking at one of Jason Taylor’s photo from El Salvador. 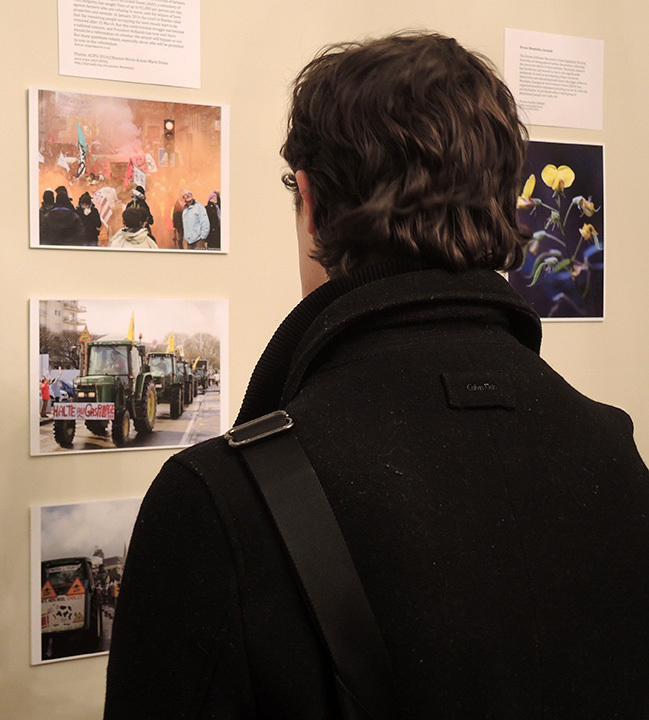 Viewing one of Jean-Marie Drean’s photo during a demonstration in Nantes, 22 February 2014. Notre-Dame-des-Landes is a commune near Nantes in Western France that has been built on a site that has been proposed for a new airport. 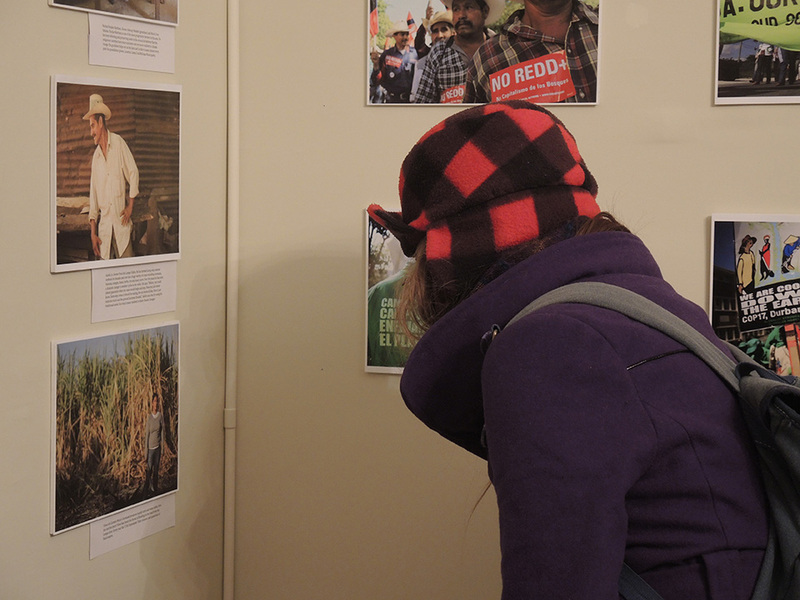 Looking at Luka Tomac’s photos entitled: Governments, you cannot silence people’s demands for climate justice! More shots from El Salvador by Jason Taylor. Tuesday through Friday 1:30 to 4:30 p.m. / Friday evening 6 to 8 p.m. / Saturday afternoon 1 to 3 p.m. 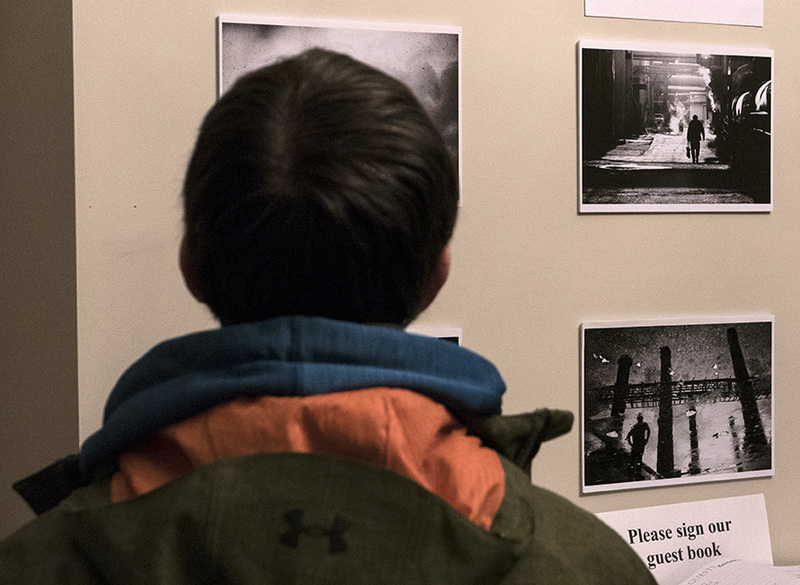 Entrance to the Gallery is free and open to the public.